After five decades of existence in D.C. and in Texas without winning a single pennant, the Rangers have stormed to the World Series in each of the past two seasons. More impressively, this is a team with success that’s built to last. Through shrewd drafting, scouting, international spending, player development, and trades, the Rangers built the best organization. Over the past few years, they’ve graduated scads of impressive young players to the majors. Yet the Rangers still have baseball’s most loaded farm system, per Baseball America. When that next generation of players arrives, expert instruction awaits. When the time comes for those players to negotiate their first big contracts, the Rangers will have more than enough funds to keep the best of the bunch. The 2012 Rangers do have a few question marks, with last year’s ace leaving, several regression candidates still here, some nagging spring injuries, and the fortification of their chief rivals. But there’s World Series upside on this roster. Again. On paper, a beastly bunch. But you can poke a few holes in this lineup, loaded as it is. The Rangers are saying Hamilton’s groin injury is nothing serious, but Hamilton has a reputation for gimpiness, including a sports hernia that required surgery last fall; spring injuries aren’t reassuring for a player who’s had only one season with more than 133 games played. Napoli’s recovered from the ankle injury he suffered during last year’s World Series, but he’s a Plexiglas case waiting to happen after going nuts with a .320/.414/.631 2011 campaign. Center field remains unsettled, with Borbon a replacement-level bat and prospect-in-waiting Leonys Martin an intriguing talent who’s still very raw (of course David Murphy’s going to end up with 400-plus at-bats and be pretty good when he gets them, as always). And Andrus offering zero pop in the no. 2 spot is one of several Ron Washington managerial quirks that add up to a couple of added losses a year. And let’s ignore the copious thunder in the lineup a little longer to focus on a more subtle team strength: The Rangers play excellent defense. There may not be a better infield defensive trio in baseball than Beltre, Kinsler, and Andrus. 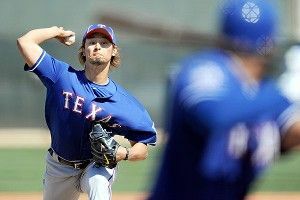 Darvish has impressed from the start this spring, with his final Cactus League start yielding 11 strikeouts in six innings. Which is great, because all he needs to do is replace a 6-WAR pitcher who helped lead a team to the World Series. C.J. Wilson’s great 2011 notwithstanding, the Rangers’ strength again lies in subtler areas. Collectively, Matt Harrison, Derek Holland, and Colby Lewis gave Texas nearly 600 innings of well-above-average starting pitching last year at a total cost of less than $3 million. That’s a tribute to the team’s ability to find undervalued commodities on the trade market (Harrison, one of the lesser catches of the Mark Teixeira megadeal), in the draft (Holland was a 25th-round pick), and elsewhere (the Rangers signed Lewis to a dirt-cheap two-year, $5 million deal with a $3.25 million club option after a strong showing in Japan). The bullpen should be effective and deep this year, too, though with a different look. Feliz’s ascension to the rotation opened the door for Joe Nathan to take over as closer. A 37-year-old closer who missed all of 2010 and struggled with velocity and the long ball for a good chunk of last season is a curious way to spend $14.75 million. But thanks to multiple trades and that vaunted farm system, Mike Adams, Alexi Ogando, and others stand ready to eat up high-leverage innings or even take over for Nathan should the need arise. Holland. The notion that second-half stats can predict a breakout is a controversial (and not necessarily correct) one in baseball circles. But Holland was a command hound throughout his minor league career, putting up terrific strikeout-to-walk ratios — something he finally managed to do in the second half of last year, when he struck out more than three batters for every walk issued. He’s 25 years old, with 63 major league starts under his belt. Call this a hunch pick if you must, but this could be the year he becomes a 5-WAR pitcher (or better). A third straight trip to the World Series awaits. The Rangers show few weaknesses anywhere on their roster, and have the prospects, the will, and the cash to make upgrades in-season should a need pop up. They field another great ball club, but fall victim to the numbers game. We’ve talked about it before: The American League might have six very good to great teams this year, the Rangers being one of them. One of those strong contenders in the East or West that doesn’t win its division is going to miss the playoffs. Texas could win 88 games and still be that team.